Established in 1947, McClancy began with a specialization in custom sausage formulations by its founder, George McClancy. Traveling across the South, George worked with small pork, ham and poultry suppliers to create flavors that the local population craved. From the start, McClancy has always been attuned to what our customers and, in turn, your customers are hungry for; it all starts with the right food ingredients, proper sourcing and a partner that can help you manage all of the ingredient quality and compliance issues that make up the market segment you compete in. Creating batch-to-batch consistency is the backbone of the millions of prepackaged custom formulations that we ship each year. Whether your production size is thousands of pounds (or gallons) or just a few grams, we have the packaging options to meet your requirements. At McClancy, we help you take full advantage of our food product development team to work with your process team to create specific opportunities for food product development, as well as manufacturing efficiency. Changing customer trends and health concerns demand that now, more than ever, we consistently meet the nutritional needs and health concerns of your customers. We can produce products under Orthodox Union supervision, Certified Organic Products, and Halal. Let us help you create the next generation of products that address the nutritional needs and health concerns of your customer - and drive the bottom line of your company! When it comes to custom blending, we help you develop the perfect formulation for your specific needs; or, we can match and manufacture your existing formula with precision and consistency. Whether you need seasoning blends or sauces and gravies, McClancy can deliver customized solutions, not offered to other food manufacturers, within your budget and timeline. Precision-ground spices to ensure heat and pungency standardization and particle sizing. At McClancy, we will personally discuss your interests with you and tailor your visit to your specific needs. Increasingly, food processors are turning to food development companies with the capabilities to, not only provide blending but a culinary and R&D team that can react to the opportunities of the moment. McClancy is a leader in the industry with new product development. With McClancy, we help you achieve the end-product you imagine; with your feedback, we can provide customized samples through the testing and development phase, as well as the flexibility of production lead time to place your product on the market at the right time. 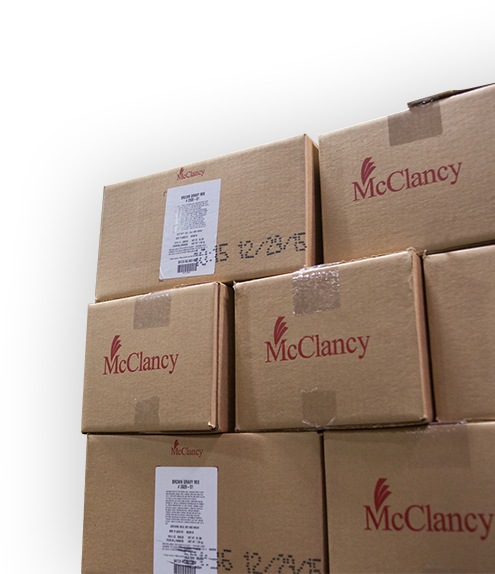 McClancy can package your product to your exact specifications. Our high-tech process control ensures consistent product quality that you can trust. Whether you need ingredients packaged in bulk or in your batch sizes, our state-of-the-art packaging equipment is prepared to handle your needs. McClancy has been a trusted name for almost 70 years. As we continue to move into the future with our clients, our experience, expertise, resources and innovation continue to grow and improve. Our family-owned business is equipped with the R&D resources, custom blending and packaging options and distribution necessary to help your business compete in the food industry. Further, we provide strict Quality Assurance, flexibility, consistency and competitive pricing you will not find elsewhere. At McClancy, we are your strategic business partner positioned to help your company.